Buy Crusader Kings II: Horse Lords - Collection and get the games download now! Mongol Unit Pack: This unit pack adds seven new unit models exclusively for the Mongol culture. Early Frankish, Early Germanic & Italian Unit Packs: These unit packs that adds unique unit models for early Frankish and early Germanic cultures, as well as units for Italian, Roman and Lombard cultures. Cuman Portraits Packs: The Cuman Portraits pack adds thousands of unique face combinations for male and female characters of the Cuman culture group. Songs of the Steppes Music Pack: These songs run while playing ruler among any of the steppe cultures of CKII. NOTICE: Requires the base game Crusader Kings II in order to play. Activation key must be used on a valid Steam account, requires internet connection. 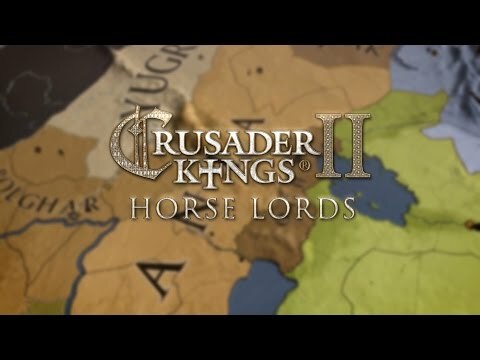 Crusader Kings II: Horse Lords Collection brings together the main Horse Lords expansion which introduces new systems and game mechanics together with the bumper content pack. Whilst the main expansion offers the chance to build your empire from the ground up, the content pack features a mix of unit and portrait packs to complement the Songs of the Steppes Music Pack.